BBC Radio 5 live sports extra, report on the BBC Sport website. Surrey Storm and Manchester Thunder will compete for the 2014 Superleague title in Saturday's grand final at Worcester Arena. Unbeaten Storm finished the season top of the table and beat Hertfordshire Mavericks in the semis, while Thunder overcame reigning champions Team Bath. The match is a replay of the 2012 final, which Thunder won by two points. "It is going to be tough because Surrey are unbeaten," Thunder coach Tracey Neville told BBC Radio Manchester. "We haven't yet been able to get on top of them this year, so we're going to be asking a lot from our girls. But after beating Bath on Monday night, who knows what to expect?" 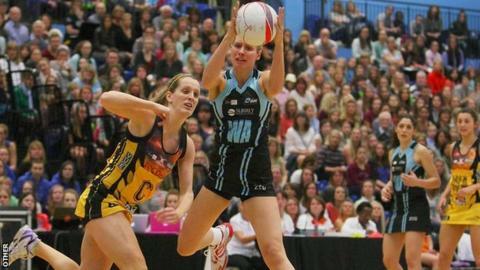 Surrey Storm have twice made the grand final but are looking for their first piece of silverware since forming in 2009. Tamsin Greenway's side are favourites for the title after their unbeaten run in the regular season, in which they picked up four points against Saturday's opponents. The former England international said: "The players have worked hard all season towards this goal. We are in the best shape we have ever been in and I am very positive ahead of Saturday's final. "I know that if we maintain our focus, play consistently and fight for every ball, we can make it third time lucky." If Manchester Thunder win, they will equal the Mavericks' total of two titles in the last nine seasons. "We won the title in 2012 and that was the first time a northern team had ever won, and we're the only northern team that has been in a grand final twice," added Neville. "We're not only bringing it home for the north west, we're also bringing it home for the north as well." Who will be crowned Superleague champions? Read more on Netball Superleague: Who will be crowned champions?